First let me try to articulate because all I keep saying is “Oh my god! Oh my god!” Surely I have more words in my vocabulary. I can tell you that Sleepy Hollow truly was one of the best pilots I have ever seen. The acting was brilliant and the chemistry between Abbie (Nicole Beharie) and Ichabod (Tom Mison) was beautiful as was the cinematography and special effects. And you can quote me on that! Last night was filled with crazy excitement and Regal Cinemas had a line out the door that was as longer than the Great Wall of China! 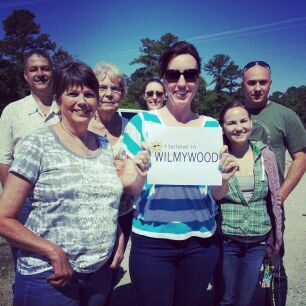 People drove from Salisbury, NC where the pilot was shot, and there were many who have worked on the show in later episodes. Other folks were simply Tom fans, Orlando fans and Wilmington film fans. Matt Born took some great shots from last night. Visit his photo gallery now! Not only did they have some Sleepy Hollow swag, but an inside look of the show and a special guest. Orlando Jones just happened to show up with Ichabod Crane’s wife, Katrina aka Katia Winter. I will post video for you later today! The only disappointment of the night was there were a ton of people that waited in line for a very long time and didn’t get in because it was oversold, even after Regal opened a second auditorium to accommodate the masses. But they did give out Sleepy Hollow t-shirts to those who couldn’t get in. The people who did get the chance to see the pilot, didn’t get that sweet stuff. All in all, it just proves the show has a major buzz. The television premiere is Monday, September 16th 9pm EST on FOX. As reported a couple of weeks ago, Wilmington based Marty Siu is the extras casting director for Spongebob 2 which is shooting in Savannah, GA. If you can work as a local in Savannah, or if you just want to register and be added to her database for future projects here in Wilmington, check out her brand spankin’ new web site! Hallmark’s Christmas in Conway is shooting on E. Renovah Circle still in the Forest Hills area. Local Boys from Crane House are shooting a music video for rap artist “Ttip” (no, that’s not a typo) on the top of the City parking deck on N. 2nd St. Principal casting begins on The Dempsey Sisters tomorrow. Production begins in September for Swirl Films. We did it! 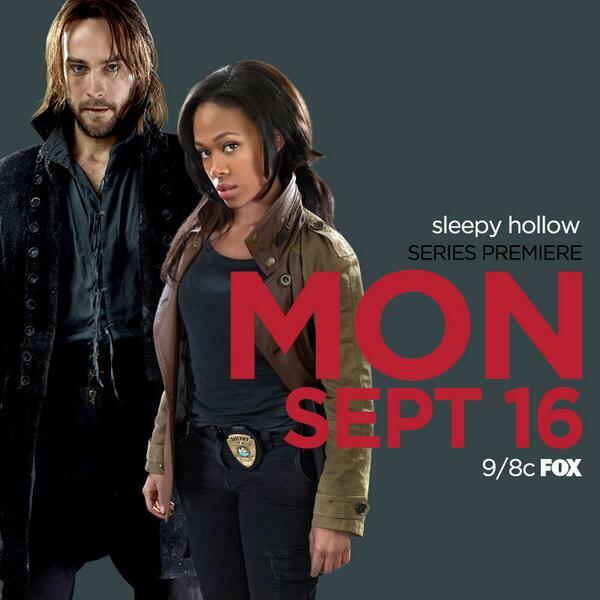 Wilmington along with New York and Chicago are getting an advance screening of FOX’s Sleepy Hollow. The show airs on Fox September 16th, but we get to see it this Tuesday, August 27th at Mayfaire’s Regal Cinemas! Our lovely lady from WECT/WSFX Ashlea Kosikowski will host the event. Perfect choice! Go hot mama go! I’ll let you know about tickets later today. If you spot police cars coming and going on near the 200 block if N. 5th St today, chances are it’s just Sleepy Hollow filming as they are doing some police work within the scene they are shooting. 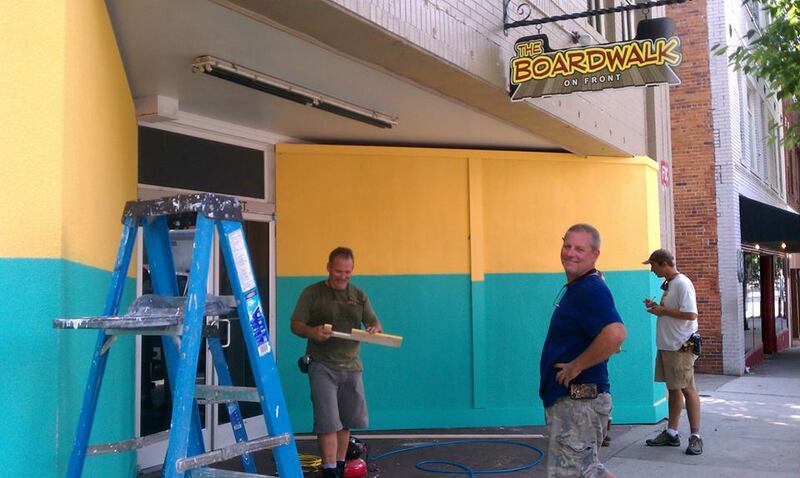 There was a big buzz on the set of Eastbound and Down yesterday, the final day for EBD. 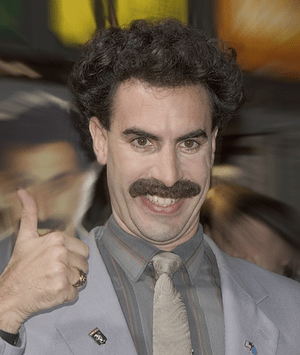 Sacha Baron Cohen graced us with his presence, well on the lot anyway. He was here for the past few days. I wonder if he actually got to see a ‘lil of Wilmywood besides the lot? Hope so. The gang has moved on to Charlotte. But before Danny McBride left Wilmywood, he did say he hopes to bring more projects here. Um, Loomis Fargo w/ Jim Carrey and Owen Wilson, perhaps! After all he and Jody Hill did write and the word remains, they are looking at early 2014. 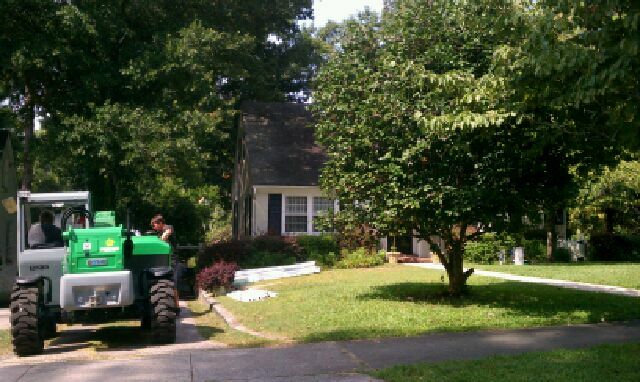 WHAT’S UP IN WILMYWOOD – 08/16/2013 Lindsay Lohan, NC Film and TV Incentives Summit and More! Charlotte is hosting the North Carolina Film and TV incentives Summit tomorrow at 1pm sponsored by a grassroots organization called Film Incentives Work. It’s scheduled for 1 p.m. at the UNC Charlotte Center City Auditorium. It is free to the public but you MUST RSVP. Sleepy Hollow is in Winnabow today. They are also shooting on Sunday and need you! CASTING CALL ALERT! They are looking for Men and Women, ages 18 and up! Get up with Extras Casting Directors, Missy and Susan for all details NOW! We only have a few days left to ensure our EARLY SCREENING of Sleepy Hollow. VOTE NOW and Demand It. You can vote every 24 hours!! It all ends Monday!! C hristmas in Conway is shooting back in the Forest Hills neighborhood. And just around the corner, there was a huge geeking out session at A Little Taste of Italy (1101 South College). I can’t say I blame them!! Andy Garcia showed up for a little taste of that goodness. What’s it like to work with Lindsay Lohan after her stint in rehab? What dreams came true on set of Eastbound and Down? Read the full report now! That just about does it for me; I will have more Wilmywood updates for you Monday morning and every weekday morning at 7:30am & 8:30am LIVE on Sunny 104.5. Got Scoop? Email me: sheila@1045sunnyfm.com. Or message me on Wilmywood’s FB . Or just post your comments below! Until then, that’s a wrap!! WHAT’S UP IN WILMYWOOD – 08/15/2013 LINDSAY LOHAN IS IN TOWN! Well, I was gonna be quiet about it, but TMZ per their usual sneakiness just leaked the news. Lindsey Lohan is in town for a stint on Eastbound and Down. SPOILER ALERT: She is playing the adult version of Kenny’s illegitimate daughter on the season and series finale. So what is like to be with her on set? Yesterday, my sources said she was really nice to everyone and is happy to be back in the acting world. I am actually really excited she is here because I am pulling for her to get her career back on track. I think I have watched Mean Girls like 100 times! And if that is not enough, guess who else is in town? 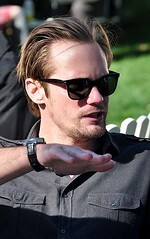 If you’re a True Blood fan, you will love to know Mr. Hotness Alexander Skarsgard will be on set today as well! Eastbound has pulled out all the stops when it comes to cameos this season! A huge scene is supposed to go down on Eastbound and Down in Castle Hayne this afternoon, weather permitting. Our gorgeous local boy, Dominic Santana is back in the local ET news. Or more like BET news! Huge congrats are in order as Dominic will continue his stint on the second season of the comedy, The Game. “I’m looking forward to what BET may have in store for me and representing Wilmington film.” Production starts back up in October. Love that man! He gives the BEST hugs! Congrats Dom! As far as filming goes today, the weather is not helping. Christmas in Conway is supposed to back on Forest Hills Drive. Sleepy Hollow is in luck as they are shooting in Atkinson today. Hopefully the weather will hold out for them. We are in 2nd place. Let’s try to take over New York and reach the #1 spot to ensure our early screening of Sleepy Hollow! We need 100 votes to reach #1 VOTE NOW and VOTE EVERY DAY. Wilmington shot The Conjuring is now at #7 on the Top US grossing horror movies of all time! Jaws still remains #1 after more than 38 years. Sleepy Hollow is shooting behind Screen Gems today. 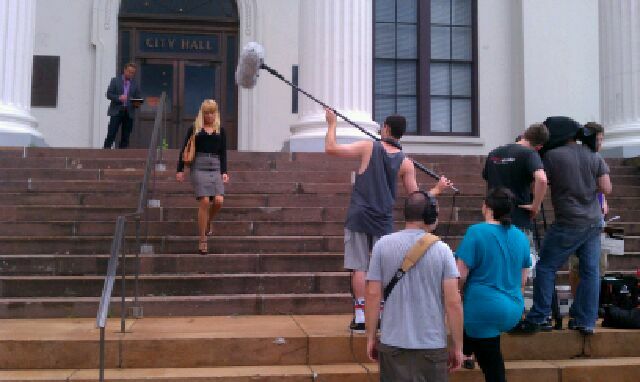 Gonna be a cool scene. Those damn witches! They are setting car on fire! Explosions! 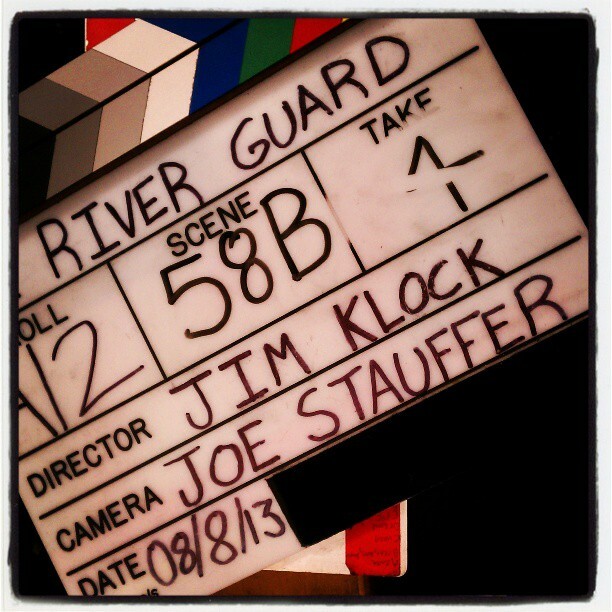 River Guard is filming on 42nd St today. Actually they’ve been shooting since 4:30am! Yuk! And it’s back! The 3rd annual Dirty Dancing Festival is this Saturday in Lake Lure, NC where a lot of the film was shot. The money raised from the festival will go to the fight against pancreatic cancer, the very same form of cancer that killed Patrick Swayze. And finally, sorry I didn’t get to this earlier but CONGRATS to Marty Siu! Our local girl is the official extras casting director for the next Spongebob movie, to be filmed in Savannah, GA during the month of October. This will be the sequel. They are mixing live action with animation. PLEASE DO NOT SUBMIT YET. Marty will let us know when she is ready! But you can give her major kudos for getting the gig! Wish it was here, but hey, we love our Marty! Christmas in Conway, starring Mary Louise Parker, Andy Garcia and Mandy Moore, is back on Forest Hills Drive. I did a quick drive by yesterday, and that thing is HUGE. And I gotta give kudos to the locations department. They did a great job, because the way the house and trees are situated you can barely see it from the road. River Guard is ready for day 4 in the Historic Courthouse on Princess St . downtown. We will see Eric Ladin, Brett Cullen, Jeff Kober and Peter Jason today. Sleepy Hollow’s is filming just outside the downtown area on N. 15th St. The 2nd unit will be shooting later tonight. VOTE VOTE VOTE – Get us that early screening of Sleepy Hollow here in Wilmington! We only have a few more days to vote – you can do it everyday!! Eastbound and Down was all over downtown for the 2nd half of the day. Big shout out to Ron and Mike, part of the construction crew. They have been doing a great job doing all these quick builds. Here’s one of them! Hey, where did the windows go! Haha! Nice work boys! I have ONE MORE “We’re the Millers” T-Shirt. It is a XXL. If you worked on the show and ONLY if you worked on the show, and you would like to have this T-shirt and WILL wear it proudly, email me: sheila@1045sunnyfm.com and I will pick one of you to win it! WHAT’S UP IN WILMYWOOD 08/07/2013 – Win ‘We’re The Millers’ Swag! River Guard is back in court today at the old courthouse downtown. Peter Jason Brett Cullen, Eric Ladin, and Jeff Kober will be on set today. Christmas In Conway will shooting some more driving scene again today. – Oleander Dr., Dawson St., 17th St. and 16th St. They will also be back on Country Club today. Have you seen the most awesome swag we gave to give away? THANK YOU CARMIKE CINEMAS!!! I will have more to give away tomorrow morning at 8:30am during What’s Up in Wilmywood on Sunny 104.5! 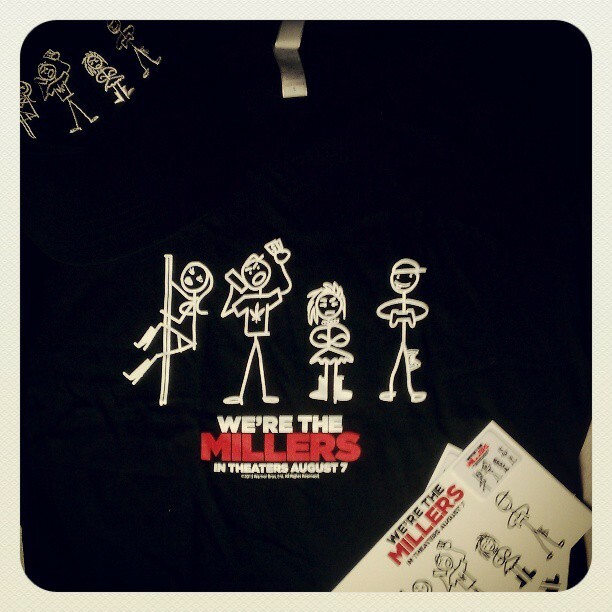 We’re the Millers tickets and swag to give away thanks to Carmike Cinemas! That just about does it for me; I will have more Wilmywood updates for you tomorrow morning and every weekday morning at 7:30am & 8:30am LIVE on Sunny 104.5. Got Scoop? Email me: sheila@1045sunnyfm.com. Or message me on Wilmywood’s FB . Or just post your comments below! Until then, that’s a wrap!